BOGOF Bingo was founded in 2009 by the Sportsbooks company Betfred. The brand operates on the Virtue Fusion Platform, but it is due to close on 31st March 2019. 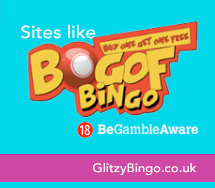 If you are looking for sister sites like BOGOF Bingo why not try the below alternative sites which have a variety of similar bingo and slot games.